Use the simplest method to stop the bleeding! Hold direct pressure to the wound site. 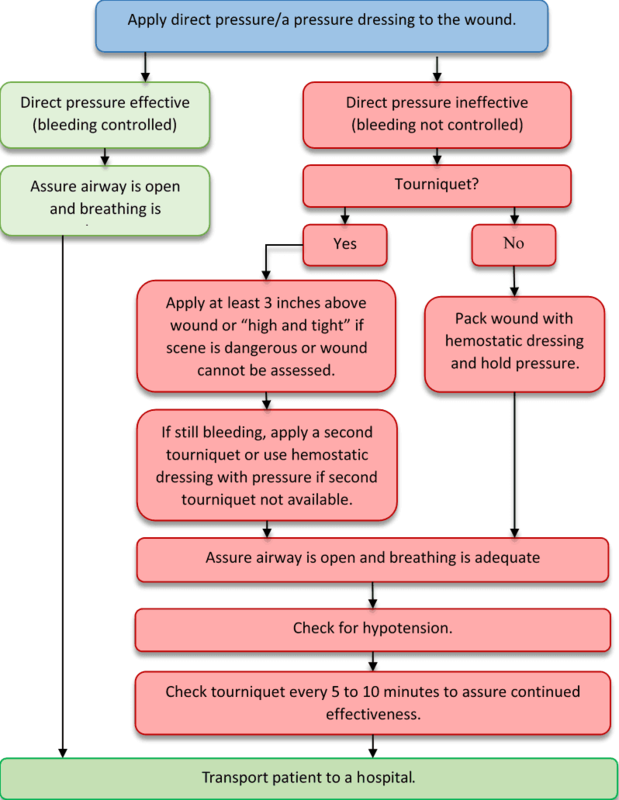 Use an israeli pressure dressing and hemostatic gauze to hold extra pressure and speed clot formation. If the cut is on a limb, apply a tourniquet proximal to the injury site. Figure 1: Based on New York State trauma protocols. If you have nitrile gloves, put them on before touching someone else’s body fluids. Although your skin protects you from blood borne diseases, bacteria and viruses can slip through even the smallest cracks. If you happen to have latex gloves, know that about 1% of people are allergic to latex, and their allergic reactions can be very severe. If the bleeding is on a limb, raising the limb above the torso helps to stop bleeding because gravity pulls blood away from the cut. After getting cut by rusty metal or dirty objects, call your doctor to see about getting a tetanus shot. Adults need to receive a tetanus booster shot every 10 years. Skin glues like Dermabond and Vetbond stop bleeding by bonding the edges of the cut together like stitches. The glue dries fast, promotes quick healing with less scarring, and forms a protective barrier against infection. It works best on small to medium cuts with clean edges. The Emergency/Israeli bandage is a pressure bandage that works by holding pressure directly on the wound site. It is an effective treatment for very severe bleeding, especially when combined with hemostatic gauze. These come as gauzes, granules, and sponges that contain hypoallergenic clotting agents to speed up the natural blood clotting process. They are effective at treating very severe bleeding, especially when packed inside the wound or used in combination with pressure bandages. Only the most severe, life-threatening injuries to the arms and legs require tourniquets, but they have been proven to save lives in both civilian police forces and the military. Injuries that are treatable by tourniquets include amputations, crushing injuries, and cuts to major arteries in the limbs. Read here our comparison between the SOFT T Wide and CAT tourniquet. While typically associated with other injuries, chest seals are a type of occlusive dressing that create an airtight and watertight barrier by adhering to the skin around the cut. For more information, read our article: Chest Seals vs Occlusive Dressings: What's the Difference? Medical gauze combined with pressure can stop most bleeding, and gauze with tape makes a versatile, effective bandage. 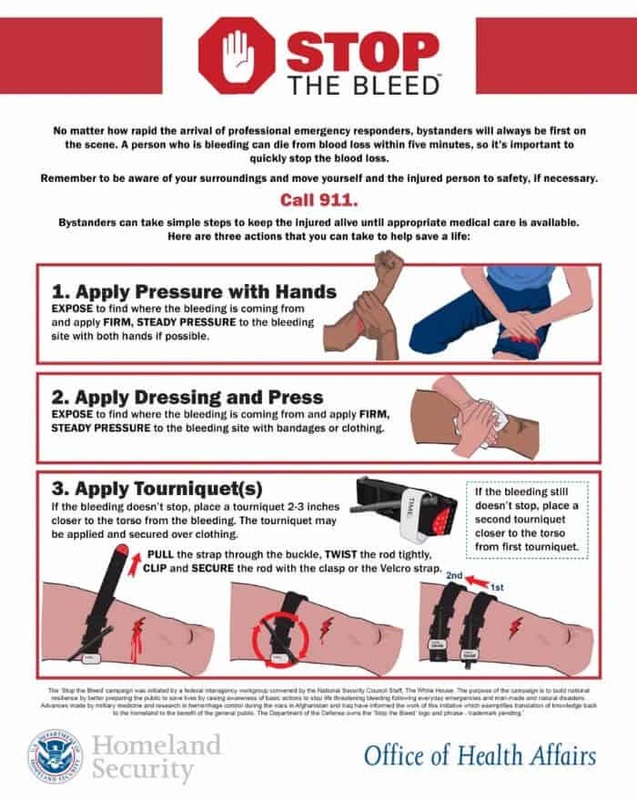 Stop the Bleed is an initiative by the U.S. Department of Homeland Security to educate the public on bleeding control. Bystanders will always be the first on the scene of an accident, and every second counts when major hemorrhage is involved. Help spread the word! The bleeding site is often covered up by clothing. For fast access to the wound site, get a pair of trauma shears. Hemophilia - A bleeding disorder that slows down or prevents clotting. Tetanus - A serious disease that can be introduced to your body through open wounds or cuts. Tetanus can be prevented with a vaccine. Chest Seals vs Occlusive Dressings: What's the Difference? Join thousands of other EMT and EMS professionals. Receive our email newsletter with the latest news, innovation and technology in the emergency services field. Peter Oldani graduated college with a B.S. in biomedical engineering, worked as an EMT to gain hands on experience in emergency medicine and completed active shooter training as part of New York State’s initiative to prepare civilian organizations for disaster response. Follow Peter on Quora and Linkedin. Learn more about Inside First Aid here.